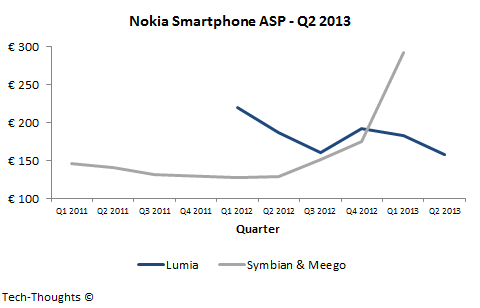 Nokia announced financial results for Q2 2013 that missed consensus analyst estimates. 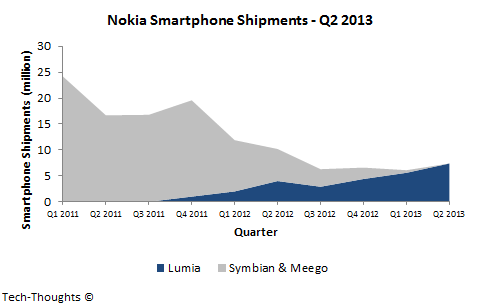 Nokia reported a rise in Lumia shipments, to 7.4 million, and a drop in feature phone shipments, to 53.7 million. However, sharp drops in respective ASPs along with flat operating expenses led to a loss and cash burn of more than €400 million. Sequentially, the decrease in our Smart Devices ASP in the second quarter 2013 was primarily due to a negative mix shift towards sales of our lower priced Windows Phone 8-based Lumia products as well as our pricing actions. This suggests that Nokia resorted to price discounting in order to meet its commitment of at least 7 million Lumia shipments. It is also interesting to note that the operating expenses on the Smart Devices portfolio was essentially flat QoQ even as the product mix shifted towards cheaper devices. The resulting negative contribution margin, even after multiple years of restructuring and cost cuts, suggests that Nokia's smartphone business is still not sustainable. Compared to the first quarter 2013 we had lower sales of our devices that we sell to our customers for above EUR 30. This decline was partially offset by higher sales of our devices that we sell to our customers for below EUR 30. The feature phone business has long been a cash cow for Nokia, which it has used to "finance" the transition in its smartphone business. However, those days may be over as Nokia reported sequentially flat operating expenses and decline in gross margins, leading to a contribution margin of just 0.2%. 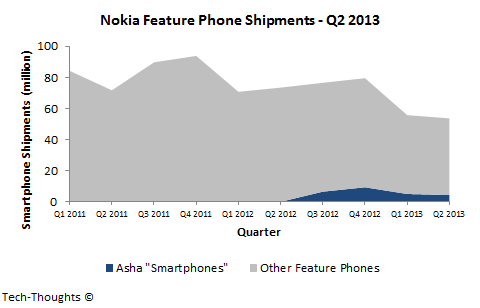 Nokia has attempted to pitch the recently launched Asha 501 as its savior, but these figures suggest that any recovery may be short-lived. Nokia's operational results clearly show that the current state of its handset business is still unsustainable because of competition from smartphone vendors with far lower cost structures. The steep decline of Nokia's feature phone business suggests that there is still no clear path to stability with their current strategy. After Nokia's acquisition of NSN, the best hope for shareholders may be an outright sale of the handset division, in order to refocus the company's resources on the profitable networking business.